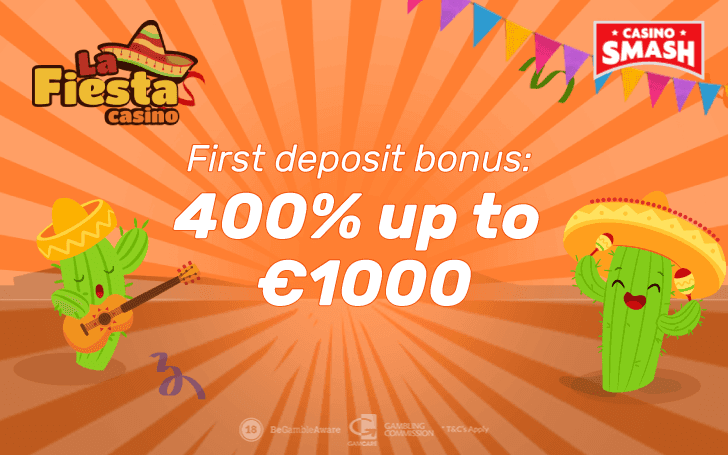 Do you want to get free €10 and five times more cash on your first deposit? We're here to help you. I’m not a fan of spending too much at a new online Casino I’ve just registered at. I want to be smart with my budget - and I’m sure you’re in the same boat. Usually, I spend no more than €20 on my first deposit. Ok, I lied a bit when I told you that it’s a bonus for stingy players. High-rollers can have a blast with it too, as the offer goes as high as €3,000. Maybe it’s just a bonus for everyone, then? 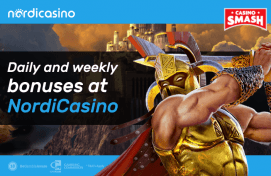 Don’t forget that this is an exclusive offer for CasinoSmash readers. That’s why you have to use our links - and the bonus code. The first deposit bonus at La Fiesta Casino is something to be happy about. It’s not your typical 100 or 200 percent offer you can find at any other Casino. It’s a 400 percent bonus that gives you five times more cash of up to €1,000. Which means that you’ll play with €100 if you deposit the minimum of €20 - and so on. Claim it here and play hundreds of Slots and Scratch cards under the Bonus Games section. Keep in mind that the bonus amount must be wagered 45 times before you make a withdrawal. Luckily, that’s pretty much the only requirement. Still, you must read the bonus T&Cs before you play. That’s a rule. Now, it’s time to check out Casino La Fiesta. If not for the bonuses, at least for the free Slots and other games you can play whenever you want. Hungry for more free Slot machines? Check out our list of the best free Slots with bonus rounds.